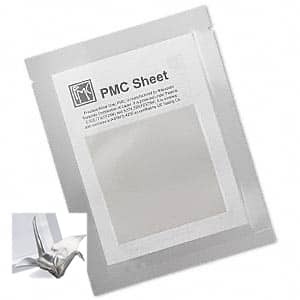 PMC+ paper is a thin, flexible sheet that allows you the creative freedom to fold, form, onlay, weave or decorate. After firing, it comes out of your kiln as a pure fine-silver object. Each sheet has a thickness of .01" (30 ga.) before firing and is about .009" thick after firing. PMC+ fires at a lower temperature, allowing you to combine sterling findings with your PMC+ before firing. PMC+ is suitable for torch-firing as well as kiln-firing.